The PUMP-Pak is made of tough, black cordura nylon with a sturdy top handle. It zips completely around, and is fully insulated. 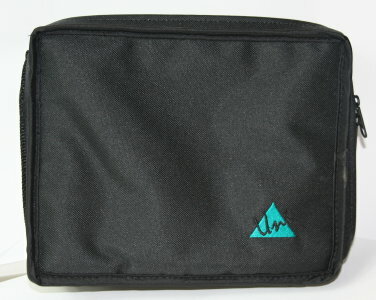 8"w x 10"L x 2"D. The see-through pockets inside, hold all your necessary pump supplies in designated areas. Keep one in your car, one in your suitcase for traveling and one in your family emergency kit. Great for quick get-a-ways! Designed to be put inside our Carry-On-Bag for travel. Shown here with the Carry on Bag.